Hello everyone, and hey, it’s a new year. Well I mean I’ll beposting this article in 2015 but I’ll assume WICID won’t be posting articlesfor a while due to holidays, so I’ll do some time travelling here and pretendit’s 2016. Wait, pretend? I mean IT IS 2016! But yeah a new year and I’ll be covering one of two events thatwill be making their debuts as well, so to speak. As you all know I coverwrestling themed articles, mainly independent shows I get to either watch liveor help out with. 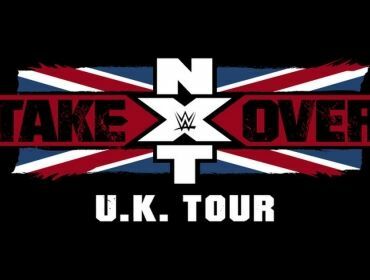 This event however is one of the bigger ones, and especiallymuch so as this is the first time WWE’s development show NXT tours the UnitedKingdom. This show will be covering the show in Cardiff I got to see, the laststop before their Takeover Special in London the next day, which I’ll be seeingLive. Yes you can expect an article on that after this as well so don’t worry. But that’s an article for another time; let’s focus on Cardiff’sshow for now. To anyone who should know, the other shows that have toured theUK thus far have been very positive in terms of fan turnout with very fewvideos of unique chants that you’d expect from crowds in this country. WithCardiff being the last stop, I wonder if we could top it off. But BEFORE I get to the main show, I’d like to take a briefmoment to mention that while most people paid for regular tickets to this show,I made a costly decision to purchase a VIP ticket, which lets me have a meetand greet with selected NXT Superstars and Women before the show starts. Well,women or Divas, whatever you want to call them, but I’ll get to that briefly. 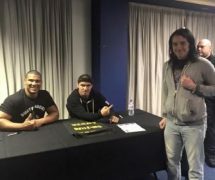 The select people we got to meet for the signing were the tagteam of Jason Jordan and ChadGable. Both seemed very relaxed and didn’t mind me asking a question. Iasked them what is the best advice they could give anyone starting out in prowrestling, and they basically told me to think of a character that is bothrelatable to myself while also trying to make it as natural as possible. Thisadvice comes as no surprise to me in my wrestling training thus far, but it’snice to hear these words from a team that is getting much appreciation from theNXT faithful, now more than ever. But honestly, other than this short meeting, there wasn’t muchelse to the VIP package. I expected at least a few more people there to talkto, but it was onlyJordan & Gable. 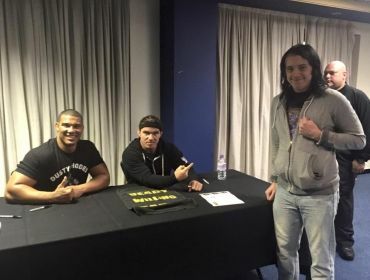 I was somewhat let down by this,and sure I didn’t expect everyone to be there, but it would have been nice tothe venue or even WWE themselves to acknowledge who would be involved in theVIP Package. I mean I also got let in earlier to see them, buy merch and getcloser row seats, but other than these, it seemed very underwhelming. So justas a heads up to anyone who is thinking about VIP packages for the future,unless the venue officially announces who will exactly be there, don’t botherbuying it. Granted. I still like and respectJordan& Gable, they are one of my favourite acts in NXT right now. But itwould have been nice to know if it would be them; or one or two women, orone or two main eventers, Or a different team. Not saying: “Selected NXTSuperstars or Divas’, say *Insert name(s) here* Will be there”, just toavoid letting other people down. You would also save more money by doing so,which is an issue that is crippling me in at the moment. You could use thatsaved money to buy WWE merch from their website for the same price as it wouldbe at the venue, sometimes cheaper. Naturally I bought two shirts (NXT UK 2015Tour and Sami Zayn) and a FinnBalor jacket, which while Iadore them all and will be taking to London with me, they still cost a lot ofmoney too. So many money issues, it never gets easier does it. The venue itself was again very pricey because it was at theMotorpoint Arena, but thankfully the ques weren’t as crazy as the WWE Liveevent I covered in April. Saying that, It was also a shame that they wouldallow you to take in outside food or drink. I say this coming from someone whoneeds to have something on hand at all times, whether it is a drink orsomething sweetie due to my diabetes. Luckily I didn’t have a hypo during theshow so there wasn’t anything to worry about, but it’s still a shame I couldn’tsave more money by bringing something for myself. Granted WWE have recentlybeen more cautious about what people bring to their shows recently due to faninteractions getting out of control more commonly so I can understand why wecould bring in things this time. Before the opening match we got hyped up by the ring announcerfor the evening, a short video package hyping up the current NXT Champion Finn Balor, and also your usual “WWE: Then.Now. Forever.” opening, and also a short message from Triple H himself saying NXT is here in the UKand Cardiff for the first time ever. With that all out of the way, on with theshow! First off, the people LOOOOOVED Enzo& Cass and went alongwith their usual opening promo much like the Full Sail arena does on regularepisodes of NXT.Blake & Murphy, not so much. I mean their entranceis seizure-inducing levels of dub-step so that’s not exactly a nice thing tosee. We had a bit of dancing fromEnzo and Cass to start off with, but Blake & Murphy ruined their fun by beating them downconstantly with bad guy shenanigans. In the end though, Enzo and Cass were able to make a nice littlecomeback and get the pin-fall win after their Rocket Launcher finish (Enzobeing thrown by Cass off the top turnbuckle and into a flying body splash). Avery nice match that got everyone going for what is to come for this show. Before the next match began, we were happily to that the nextcontest would be “a Womens match” – WOMEN’S!? Not ‘Divas?’, but’WOMENS! ?’ this was just a happy thing to hear in this match and all the otherladies action that followed. I’ve never been a fan of the term ‘Divas’ todescribe the women of the WWE as I personally thing it diminishes everythingthe women do for the company, whether they are on the main roster or in NXT.When I see people like their NXTWomen’s Champion Bayley, or one of thewomen in this match, Asuka.I do NOT associated them with the word ‘Diva’ in the slightest. There isnothing temperamental or haughty about either of them, or many other women inthe company. Maybe this is a small step to getting rid of the horrid term, butthen again they still have their ‘Total Divas’ reality show so doubt we’d seeit go anywhere. First off, let me just say this, AlexaBliss IS SO TINY! No forreal, like she looks small on their NXT programs, but she was even shorter inperson! She’s apparently five foot one, but she seemed even shorter than that.She was also all the more stunning in person but that didn’t shock me. Butwhether small or not, there was no stopping the Japanese Mask wearing warriorthat isAsuka. Iwas tempted to buy anAsuka mask at the merch stand as wellfor character design purposes for future designs I may come up with, but Ispent enough tonight so I skipped on that for now. Asuka had the made mostly with her quick yetstiff striking style besting Alexa’s tactics of running around the ring andbeating downAsuka with quick manoeuvres of her own thatfocused on the arms and legs, Asuka’s main fighting tools. In the end, Alexa tapped out to the Asuka Lock and Asuka got herself another win. Ishould also mention during this match one idiot tried to start that horrid:”We want some Bayley!” chant early on and even a: “We areAwesome!” chant. Luckily we was shot down and even got his own:”You’re alone” chant which I though was very apropos as he diddeserve it. You had The Perfect 10 VS TheInnovator of Bull-Fit in anice cooler type of match that was mainly a comedy style match. Now I’m notmuch of a comedy person myself, call me dull or emo or whatever, but I reallyliked this match, mainly due to the antics that happened and how everyonereacted to what was happening. The facial expressions and mannerisms ofDillinger were great here and Bull is just ajolly fellow so it was hard to dislike this, not that I wanted to. The anticsincluded uses of laminated ’10’ signs, one normal size and one pocket size. Heholds the normal ten upside down claiming that he is infact a ‘1’, not a’10’, trying to eat the pocket one but putting it down his singlet, the lowerpart as you can imagine. He would eventually put that same pocket 10 inTye’s mouth as he seemed beyond himself.Both doing synced jumping jackets and more that had people in hysterics.Bull-Fit? More like GIGGLE-FIT! Ugh that was bad I know – I’m notsorry. Anyway the match eventually ended with Bull getting the advantageand hitting his Diving Seated Senton finisher for the pinfall victory. During this match we had the Princess of Staten Island, or at least for the night,’The Princess of Cardiff’ askng all “How we doin?” Just like her boysEnzo and Cass. After she finished talking I thoughtto myself: “Barry Island” – the Princess of Barry Island! Youmissed such a perfect opportunity! Thankfully some people thought the samething and got a good laugh from us for mentioning it during the match. And thematch itself was as you’d expect when NiaJax is in the ring. Shedecimated poor Carmella where you just want her to pin thegirl and get it over with. And even though Carmella had some comebacks of herown against the one ‘who’s not like most girls’, she still couldn’t get the jobdone after Nia beat her with a Bearhug release Spinebuster into a Leg Drop for the pin. This match, just saying it right now, was my match of the first half. Asuka and Alexa was a close second, but thisshort, preview match of what we should expect for Takeover the next daysurprised me in a nice way. What also surprised me was how much people like Corbin in Cardiff. Don’t get me wrong, he’s abad guy and he did get his share of dislike from people. But it was more of a50/50 split with him, maybe leaning towards more the side of them liking him.He didn’t really like them as much though, almost as much as he disliked Crewsas he made sure to give out much needed banter to people who yelled daft thingsat him. But both men here worked really well together, both of the bigger side,height wise for Corbin and sheer muscle on Crews, and they just workedreally well together. Corbin stood out more in this match for hisattitude showing through and hitting a few nicely executed powerhouse moves,but in the end Apollo got the pin-fall victory after hitting a Standing Moonsault. A verysimple match to be fair, but done very well, and also a good way to hype upwhat you can expect to see in London the next day. Except you will now expectto see more from then in London, which I’m sure was the point of this match. Intermission! Not much went on through intermission, just gotmore drinks, went to the toilet, and actually caught up with a few people frommy wrestling training place watching the show as well. It was also made clearto me that the person sitting to my left worked a match at the last Dragon Pro show I was ring crew for. I had afeeling he seemed familiar, but I didn’t want to be rude about it. Also sawsomeone who worked a past DragonPro show and I completelyforgot who he is. Erm, shoutouts to ChuckCyrus and Kelly Karakot, if that meansanything? Sorry. But yeah everyone loved it, the crowd was way into this match, but not so much the result as by the end of it, the champions retained after some foot holding shenanigans which got them the pin-fall victory. After the match Jordan and Gable embraced and got the crowd chanting No Limits at them again. Emma and Dana came out first to mainly boos while Bayley got a massive good girl reactions, and an even bigger one for? THE WACKY WAVING INFLATABLE ARM FLAILING TUBE MEN! THE WACKY WAVING INFLATABLE ARM FLAILING TUBE MEN!!! Seeing them in person was definitely one of my highlights of the entire night. Now a huge part of me was so happy to hear that the Women’s Championship match started, but then that part of me was soon flooded with regret after most of the people around me and in other sections started to do that thing I hate so much. You know what I’m referring to? Why is this a thing? seriously, WHY IS THIS A THING?! Before the match could start people in the crowd began chanting that ‘Hey baby’ song at Bayley replacing ‘Baby’ with ‘Bayley’ and them wanting to know if she would be their girl. Now this I actually liked because it played into Bayley being flustered by everyone which she usually is anyway and both Emma and Dana being majorly annoyed by it. Thought I can’t say they were too annoyed as before they could lock up, sometimes people would chant it more which threw them off I even saw Emma laughing at one point, or maybe it was something in my eye, I don’t know. Needless to say most of the people around me have a similar restlessness disorder at the Full Sail arena as they would try to chant this during the match, some people getting louder and louder, and louder, which this took me from the action that was happening in front of me. And of course, when one idiot does something stupid that other people seem to like, they all do it too, and more people do it, and the vicious cycle continues. I mean, I get you’re having a good time, but come on, the women are trying to perform for you, have enough respect to let them do that for you. Plus you’re annoying others around you, and you don’t want to be ‘that guy/girl’ who everyone gets annoyed it, at least I hope you don’t want to do that. The match itself was very basic as you could imagine with Emma getting more of the upper-hand over the champion thanks to the help of Dana Brooke from the outside. Of course Bayley would fight back like the fighting champion she is, but Dana was always there to push her back down. Luckily the ref saw Dana getting involved one too many time and threw her from ringside which pleased many people. Shortly after this Bayley hit her patented ‘Bayley-to-Belly Suplex’for the pin-fall win. After the match people went around real quick to snap some quick photos and poses with the younger and more loyal fans (those who wore her t-shirt) before she left. It just came across that Bayley was there for every single person in the crowd and that is a truly endearing thing. Easily the best match of the night. In terms of who was involved, the crowd interaction, what happened in the match, just? everything. But I?ll try and sum up each aspect to say why it was so good to me. First off you have three of NXT’s biggest names in this match, two of which are the main event for Takeover London, and the other being a world fan favourite who is returning from injury. Samoa Joe got a mixed reaction, while the champion Finn Balor came out with everyone in the crowd performing to his entrance, which I enjoyed doing so much. Thought my favourite part was seeing Sami Zayn again, hearing his theme song (currently the best one in all of WWE in my opinion) and of course – that hat. THE HAT IS BACK! Now the match started with both Balor and Zayn trying to go after Joe though he would leave the ring and only strike back when Balor and Zayn locked up. Of course this didn’t last long as Joe was chased down and double teamed by Balor and Zayn. Joe even attempted to leave the match at one point, but both men stopped him from doing so. One of my favourite spots of the night was something both have been doing in some of the other UK show where they would try on each other’s jackets as well as Finn trying on Zayn’s hat, and each acting like each other. A small bit of comedy that worked so well, especially with the facial expressions that both men made seeing the other acting like that. I can’t find the proper words to describe this who thing, it was one of those ‘you need to be there to get it’, even if you watch clips of it online it wouldn’t be the same. Soon after this Joe would join back into the match and it was all magic from then out. Joe being as dominant as he can to both men, though mainly pushing Zayn away and focusing on the champion since they have a rivalry going on, and both Sami and Finn pulling out the best moves in their arsenals which were so much better to see and hear in person than you would on screen. The ended when Joe had Zayn in his Coquina Clutch finisher but Finn would go to the top and hit Zayn with his Coup De Grace, hurting both men in the result and pinning Zayn for the win. After the match, Joe attempted to attack Balor from behind a few times, but ended up leaving. Balor then got people to cheer for Sami, but Sami turned this around and got everyone to cheer for the champion. Both men left with their hands raised and slapping the hands of those in the front row. Now usually I’m not one for being like “Damn I really wish I touched *insert talent’s name here*’s hand!”, but damn I wanted to high five Finn and especially Sami so much. As well, I saw them live and that memory won’t be taken from me. And neither will this show. Even though it is faults like the VIP Package being underwhelming, the security restraints and banning of certain items, and some moronic people in the crowd, these aspects did not halt my enjoyment of the overall show experience. Also seeing a few people who I have either trained with, or had helped out with at different local shows since it reminded me that wrestling can bring me together you know, and you may meet some really amazing people through your experiences. But yeah, that’s my NXT Cardiff 2015 review, next stop? *Attempts to sound like Joey Tribbiani* LONDON BABY! Now I?m aware this review won’t be up until after Christmas due to the lovely people at Wicid needing to have a holiday break also, but even after that this review will take a little while longer as while I would be reviewing Takeover London from my Live experience, I also need to watch the show back online to see if my experience was the same as watching it on screen as I have never been under the circumstances where that may happen to me. But yeah, sorry again for my awkwardness and lack of knowledge and or/ care for others around me, I still need to get better at understanding people better and not writing too much in these articles. Which by saying that means I’ve already said too much, so yeah, until next time I guess.